David M. Axelrod (born February 22, 1955) is an American political consultant and analyst, best known for being the Chief Strategist for Barack Obama's presidential campaigns. After Obama's election, Axelrod was appointed as Senior Advisor to the President. Axelrod left the White House position in early 2011 and became the Senior Strategist for Obama's successful re-election campaign in 2012. Axelrod is a former political writer for the Chicago Tribune, and joined CNN as Senior Political Commentator in 2015. As of April 2019[update], Axelrod serves as the director of the non-partisan University of Chicago Institute of Politics. His memoir is titled Believer: My Forty Years in Politics. Axelrod was born on the Lower East Side of Manhattan, New York City, and grew up in its Stuyvesant Town area. He was raised in a liberal Jewish family. His mother, Myril Bennett (née Davidson), was a journalist at PM, a liberal-leaning 1940s newspaper, and later an advertising executive at Young & Rubicam. His father, Joseph Axelrod, was a psychologist and avid baseball fan, who migrated from Eastern Europe to the United States at the age of eleven. He attended Public School 40 in Manhattan. Axelrod's parents separated when he was eight years old. Axelrod traces his political involvement back to his childhood. Describing the appeal of politics, he told the Los Angeles Times, "I got into politics because I believe in idealism. Just to be a part of this effort that seems to be rekindling the kind of idealism that I knew when I was a kid, it's a great thing to do. So I find myself getting very emotional about it." At thirteen years old, he was selling campaign buttons for Robert F. Kennedy. After graduating from New York's Stuyvesant High School in 1972, Axelrod attended the University of Chicago, where he majored in political science. As an undergraduate, Axelrod wrote for the Hyde Park Herald, covering politics, and earned an internship at the Chicago Tribune. He lost his father to suicide in 1977, around the time of his graduation. While at the University of Chicago he met his future wife, business student Susan Landau (daughter of research doctor Richard L. Landau), and they married in 1979. In June 1981, their first child, a daughter, was diagnosed with epilepsy at seven months of age. The Chicago Tribune hired Axelrod after his graduation from college. He worked there for eight years, covering national, state and local politics, becoming their youngest political writer in 1981. At 27, he became the City Hall Bureau Chief and a political columnist for the paper. He left the Tribune and joined the campaign of U.S. Senator Paul Simon as communications director in 1984. Within weeks he was promoted to co-campaign manager. In 1985, Axelrod formed the political consultancy firm, Axelrod & Associates. In 1987 he worked on the successful reelection campaign of Harold Washington, Chicago's first black mayor, while spearheading Simon's campaign for the 1988 Democratic Presidential nomination. This established his experience in working with black politicians; he later became a key player in similar mayoral campaigns of black candidates, including Dennis Archer in Detroit, Michael R. White in Cleveland, Anthony A. Williams in Washington, D.C., Lee P. Brown in Houston, and John F. Street in Philadelphia. Axelrod is a longtime strategist for the former Chicago Mayor Richard M. Daley and styles himself a "specialist in urban politics." The Economist notes he also specializes in "packaging black candidates for white voters". In January 1990, Axelrod was hired to be the media consultant for the all but official re-election campaign of Oregon Governor Neil Goldschmidt. However, Goldschmidt announced in February that he would not seek re-election. Axelrod was retained by the Liberal Party of Ontario to help Dalton McGuinty and his party in 2002 to be elected into government in the October 2003 election. Axelrod's effect on Ontario was heard through the winning Liberal appeal to "working families" and placing an emphasis on positive policy contrasts like canceling corporate tax breaks to fund education and health. In 2004, Axelrod worked for John Edwards' presidential campaign. He lost responsibility for making ads, but continued as the campaign's spokesman. Regarding Edwards' failed 2004 presidential campaign, Axelrod has commented, "I have a whole lot of respect for John, but at some point the candidate has to close the deal and—I can’t tell you why—that never happened with John." Axelrod contributed an op-ed to the Chicago Tribune in defense of patronage after two top officials in the administration of longtime client Chicago Mayor Richard M. Daley were arrested for what federal prosecutors described as "pervasive fraud" in City Hall hiring and promotions. In 2006, he consulted for several campaigns, including the successful campaigns of Eliot Spitzer in New York's gubernatorial election and Deval Patrick in Massachusetts's gubernatorial election. Axelrod served in 2006 as the chief political adviser for Democratic Congressional Campaign Committee chair U.S. Representative Rahm Emanuel for the U.S. House of Representatives elections, in which the Democrats gained 31 seats. He was an Adjunct Professor of Communication Studies at Northwestern University, where, along with Professor Peter Miller, he taught an undergraduate class titled Campaign Strategy, analyzing political campaigns, and their strategies. On June 14 2009 he received an honorary "Doctor of Humane Letters" degree from DePaul University, speaking at the commencement exercises of the College of Communication and College of Computing and Digital Media. Axelrod first met Obama in 1992, when Bettylu Saltzman, a Chicago democrat, introduced the two of them after Obama had impressed her at a black voter registration drive that he ran. Obama consulted Axelrod before he delivered a 2002 anti-war speech, and asked him to read drafts of his book The Audacity of Hope. Axelrod contemplated taking a break from politics during the 2008 presidential campaign, as five of the candidates—Barack Obama, Hillary Clinton, John Edwards, Chris Dodd and Tom Vilsack—were past clients. Personal ties between Axelrod and Hillary Clinton made it difficult, as she had raised significant funds for epilepsy on behalf of a foundation co-founded by Axelrod's wife and mother, Citizens United for Research in Epilepsy (CURE). (Axelrod's daughter suffers from developmental disabilities associated with chronic epileptic seizures.) Axelrod's wife even said that a 1999 conference Clinton convened to find a cure for the condition was "one of the most important things anyone has done for epilepsy." Axelrod ultimately decided to participate in the Obama campaign, and served as chief strategist and media advisor for Obama. He told The Washington Post, "I thought that if I could help Barack Obama get to Washington, then I would have accomplished something great in my life." 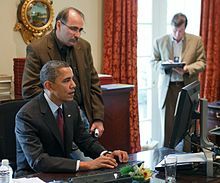 Axelrod contributed to the initial announcement of Obama's campaign by creating a five-minute Internet video released January 16, 2007. He continued to use "man on the street"-style biographical videos to create intimacy and authenticity in the political ads. While the Clinton campaign chose a strategy that emphasized experience, Axelrod helped to craft the Obama campaign's main theme of "change." Axelrod criticized the Clinton campaign's positioning by saying that "being the consummate Washington insider is not where you want to be in a year when people want change...[Clinton's] initial strategic positioning was wrong and kind of played into our hands." The change message played a factor in Obama's victory in the Iowa caucuses. "Just over half of [Iowa's] Democratic caucus-goers said change was the No. 1 factor they were looking for in a candidate, and 51 percent of those voters chose Barack Obama," said CNN senior political analyst Bill Schneider. "That compares to only 19 percent of 'change' caucus-goers who preferred Clinton." Axelrod also believed that the Clinton campaign underestimated the importance of the caucus states. "For all the talent and the money they had over there," says Axelrod, "they—bewilderingly—seemed to have little understanding for the caucuses and how important they would become." In the 2008 primary season, Obama won a majority of the states that use the caucus format. 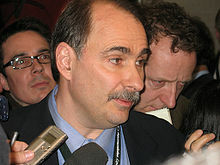 Axelrod is credited with implementing a strategy that encourages the participation of people, a lesson drawn partly from Howard Dean's 2004 presidential campaign as well as a personal goal of Barack Obama. Axelrod explained to Rolling Stone, "When we started this race, Barack told us that he wanted the campaign to be a vehicle for involving people and giving them a stake in the kind of organizing he believed in. According to Axelrod getting volunteers involved became the legacy of the campaign " This includes drawing on "Web 2.0" technology and viral media to support a grassroots strategy. Obama's web platform allows supporters to blog, create their own personal page, and even phonebank from home. Axelrod's elaborate use of the Internet helped Obama to organize under-30 voters and build over 475,000 donors in 2007, most of whom were Internet donors contributing less than $100 each. The Obama strategy stood in contrast to Hillary Clinton's campaign, which benefited from high name recognition, large donors and strong support among established Democratic leaders. Politico described Axelrod as 'soft-spoken' and 'mild-mannered' and it quoted one Obama aide in Chicago as saying, "Do you know how lucky we are that he is our Mark Penn?" Democratic consultant and former colleague Dan Fee said of Axelrod, "He's a calming presence." "He's not a screamer, like some of these guys," political advisor Bill Daley said of Axelrod in the Chicago Tribune. "He has a good sense of humor, so he's able to defuse things." In June 2008, The New York Times described Axelrod as a "campaign guru" with an "appreciation for Chicago-style politics." On November 20, 2008, Obama named Axelrod as a senior advisor to his administration. His role included crafting policy and communicating the President's message in coordination with President Obama, the Obama Administration, speechwriters, and the White House communications team. Axelrod left his White House senior advisor post on January 28, 2011. He was a top aide to Obama's 2012 re-election campaign. Axelrod also stated that his job as Obama's chief campaign strategist in the 2012 campaign would be his final job as a political operative. In January 2013, Axelrod established a bipartisan Institute of Politics at the University of Chicago, where he serves as director. On January 23, 2013, La Stampa reported that Axelrod was helping Italian prime minister Mario Monti with his election campaign and had flown to Italy to meet with Monti ten days earlier. Monti's coalition went on to come fourth with 10.5% of the vote in the Italian general election, 2013. On February 19, 2013, Axelrod joined NBC News and MSNBC as a senior political analyst, a position he held until September 2015 when he moved to CNN. In 2014 Axelrod was appointed senior strategic adviser to the British Labour Party to assist party leader Ed Miliband in the run-up to the 2015 general election. In 2015, Axelrod began hosting a podcast titled The Axe Files, a series of in-depth discussions and interviews with various political figures. He also joined CNN as a senior political commentator in September 2015. ^ Smith, Ben (November 19, 2008). "Ben Smith's Blog: Axelrod, and other senior staff". Politico. Retrieved August 11, 2013. ^ a b MacCallum, Martha (February 2, 2011). "Axelrod Departs the White House, Prepares for New Mission to Re-Elect Obama". FoxNews.com. Retrieved August 22, 2011. ^ a b Walsh, Ken (November 12, 2012). "The Election's Other Big Winner: David Axelrod". US News. ^ a b LoBianco, Tom (September 3, 2015). "Former Obama adviser Axelrod joining CNN". CNN Politics. ^ "Staff". University of Chicago Institute of Politics. Retrieved April 4, 2019. ^ "Believer: My Forty Years in Politics". Penguin Random House. Retrieved April 4, 2019. ^ MacAskill, Ewen (May 22, 2008). "He can be cut-throat. He believes that if you're in a race, you beat the other side by almost any means necessary" – via The Guardian. ^ "How Bibi Alienated All His Jewish Allies at the White House". ^ Saul, Michael (June 22, 2008). "David Axelrod is a New York City boy who has Barack Obama's ear". Daily News. New York. Retrieved April 15, 2011. "Perched atop a mailbox near his family's apartment in Stuyvesant Town, 5-year-old David Axelrod watched intently as a charismatic John F. Kennedy rallied New Yorkers for his presidential campaign in the fall of 1960. ^ Jonas, Ilaina; Gralla, Joan (October 22, 2009). "NY court rules against Stuyvesant Town owners". Reuters. Retrieved April 15, 2011. ^ "Myril Axelrod Bennett Obituary". News Times. Danbury, Connecticut. January 22, 2014. Retrieved November 23, 2015. ^ Instaread (March 5, 2015). Believer: My Forty Years in Politics by David Axelrod | A 15-minute Summary & Analysis: My Forty Years in Politics. Instaread Summaries. ^ a b c Kaiser, Robert G. (May 2, 2008). "The Player at Bat – David Axelrod, the Man With Obama's Game Plan, Is Also the Candidate's No. 1 Fan". The Washington Post. Retrieved May 6, 2008. ^ Haq, Husna (February 15, 2009). "A Newton mother's pride in Obama adviser David Axelrod – The Boston Globe". Boston.com. Retrieved February 11, 2014. ^ "The Agony and the Agony". Pqasb.pqarchiver.com. June 24, 2007. Retrieved February 11, 2014. ^ Bell, Debra (December 2, 2008). "10 Things You Didn't Know About David Axelrod". U.S. News & World Report. Retrieved November 23, 2015. ^ La Ganga, Maria L. (February 15, 2008). "The man behind Obama's message". Los Angeles Times. Retrieved April 28, 2008. ^ Greene, Melissa Fay (February 6, 2007). "Obama's Media Maven". The Nation. ^ a b Hayes, Christopher (February 6, 2007). "Obama's Media Maven". The Nation. Retrieved April 22, 2008. ^ O'Donnell, Maureen (June 24, 2016). "U. of C. Dr. Richard L. Landau, in-law to David Axelrod, dead at 99". Chicago Sun-Times. ^ "I Must Save My Child". Parade Magazine. February 15, 2009. Retrieved February 15, 2009. ^ "Partners—David Axelrod". AKPD Message and Media. Archived from the original on November 8, 2008. Retrieved April 28, 2008. ^ Reardon, Patrick T. (June 24, 2007). "The Agony and the Agony". Chicago Tribune. Retrieved April 4, 2008. ^ a b "The Ax-man Cometh". The Economist U.S. edition. August 23, 2008. p. 28. ^ Box 203 of Goldschmidt's records is no longer an active page; Box 203 of Goldschmidt's records are here but not apparently easily searchable. ^ Jaquiss, Nigel (May 12, 2004). "The 30-Year Secret: A crime, a cover-up and the way it shaped Oregon". Willamette Week. ^ Benzie, Robert (January 14, 2008). "McGuinty and Obama share strategist". The Star. Toronto. ^ Montgomery, David (February 15, 2007). "Barack Obama's On-Point Message Man". Washington Post. Retrieved May 13, 2015. ^ Wallace-Wells, Ben (April 1, 2007). "Obama's Narrator". The New York Times. Retrieved April 22, 2008. ^ "Senior Advisor David Axelrod". whitehouse.gov. White House. Archived from the original on January 22, 2009. ^ Becker, Jo; Christopher Drew (May 11, 2008). "Obama's Pragmatic Politics, Forged on the South Side". The New York Times. Retrieved May 12, 2008. ^ Scott, Janny (May 18, 2008). "Obama's Story, Written by Obama". The New York Times. Retrieved May 18, 2008. ^ Wallace-Wells, Ben (March 30, 2007). "A star strategist offers Democrats a new vision". International Herald Tribune. Retrieved May 6, 2008. ^ "Biography of Barack Obama" (Video from Barack Obama's exploratory committee). YouTube. January 16, 2007. ^ Obama, Barack (January 16, 2007). "My Plans for 2008" (Obama's YouTube video announcement of that he would file papers on January 16, 2007 to form an exploratory committee). Retrieved November 11, 2008. ^ Tumulty, Karen (May 8, 2008). "The Five Mistakes Clinton Made". Time. Retrieved November 2, 2009. ^ a b Crowley, Candy (January 4, 2008). "Obama wins Iowa as candidate for change". CNN. Retrieved May 8, 2008. ^ Dickinson, Tim (March 20, 2008). "The Machinery of Hope". Rolling Stone. Retrieved April 28, 2008. ^ Stirland, Sarah Lai (February 14, 2008). "The Tech of Obamamania: Online Phone Banks, Mass Texting and Blogs". Wired. Retrieved February 21, 2008. ^ Simon, Roger (March 20, 2007). "The Democrats Turn Tough—on Each Other". Politico.com. Retrieved May 8, 2008. ^ Brown, Carrie Budoff (April 27, 2008). "Obama team remains unshaken and unstirred". Politico.com. Retrieved April 28, 2008. ^ Fitzgerald, Thomas (December 30, 2007). "Helping hone Obama's pitch". Politico.com. Archived from the original on January 7, 2008. Retrieved May 7, 2008. ^ Reardon, Patrick T. (June 24, 2007). "The Agony and the Agony". Chicago Tribune. Archived from the original on December 25, 2007. Retrieved May 7, 2008. ^ Powell, Michael (June 4, 2008). "Calm in the Swirl of History". The New York Times. p. A1. Retrieved September 5, 2015. ^ "Obama 'to unveil economic team'". November 24, 2008 – via bbc.co.uk. ^ "Axelrod to join Obama White House". ^ Libit, Daniel (September 2011). "David Axelrod's Last Campaign". Chicago magazine. Retrieved April 13, 2012. ^ Johnson, Dirk (January 9, 2013). "David Axelrod on His Move to the University of Chicago". Chicago Magazine. Retrieved February 20, 2014. ^ Molinari, Maurizio (January 23, 2013). "New Client For Obama Guru Axelrod: Italian PM Mario Monti, In Showdown With Berlusconi". La Stampa. Retrieved April 19, 2014. ^ "David Axelrod joins MSNBC, NBC News". The Daily Caller. Retrieved February 19, 2013. ^ Wintour, Patrick (April 17, 2014). "Ed Miliband signs up top Obama adviser David Axelrod for UK election". theguardian.com. Retrieved April 17, 2014. ^ Rifkin, Jesse. "David Axelrod Book Reveals Behind-The-Scenes Drama Of Obama Campaign And Presidency". Huffington Post. ^ "The Axe Files with David Axelrod". politics.uchicago.edu. Retrieved April 8, 2019. ^ "Former Obama adviser Axelrod joining CNN as senior political commentator". CNN. Retrieved September 3, 2015. Wikimedia Commons has media related to David Axelrod. "David Axelrod collected news and commentary". The New York Times. The Axe Files, Axelrod's podcast.